It's not a secret that I like a good challenge, so the launch of the new One Little Word blog, is rather exciting! Inspired by Ali Edwards each challenge will revolve around just one word. 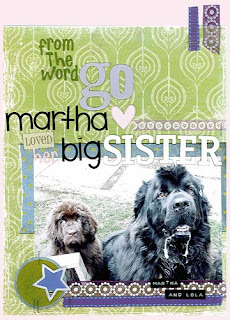 I created this page last night with a rather cute picture of Martha and Lola. Found you through you post at One Word, and just fell in love with you doggies, but also you layouts! Really really nice work! I have added you to my fav's. Also saw the true friends blog. Maybe I will join (I also have 2 doggies: check me at anouchka.web-log.nl, sorry, it's in dutch!). Love the LO...love all the bits and pieces!!! and cute pups!! This is a fab interpretation of the word GO! Such a cute pic, great layout!! Awesome dogs! My good friend has one! He is a big lap baby! Great LO!